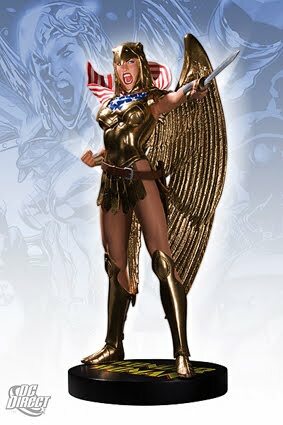 • DESCRIPTION: An armored eagle, Wonder Woman shouts a warrior's battle cry. Golden wings for flight, with golden chest-plate, war-skirt and eagle's head helmet designed to reflect the rays of the sun, blinding foes in their light. 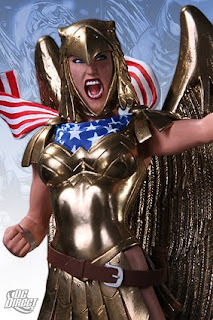 Carrying a Hephaestus-forged sword sharp enough to slice, the Amazon Princess epitomizes fierce in the midst of fight. 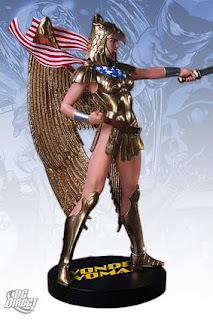 Inspired by the cover to WONDER WOMAN #173, this statue is hand-painted, cold-cast porcelain, measures approximately 10" high x 8.5" wide x 5" deep. This is packaged in a 4-color box.